The Battle of Berlin ended the Second World War the 8th May 1945. The most important thing was that it finally become peace, but neither the Russians or the allied could lift the biggest trophy of it all: Der Furer Adolf Hitler - dead or alive! No other persons have ever caused such mass hysteria around the world and so many conspiracy theories than Hitler. Photo. 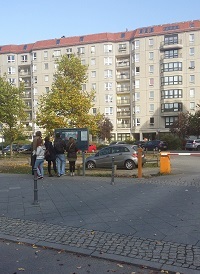 Site of the former Führerbunker. It`s not much to see today. This is the Second World War`s "cold case" that has not yet been fully solved and has not been subject of a thoroughly investigation for many years - until now. In the last 2-3 years several books have been released where the authors claim they have certain evidence for that Hitler managed to escape to South America. There always have been doubts as to Hitler's alleged suicide in his bunker in Berlin on 30th April 1945. The most authoritarian doubter was the Russian Dictator Joseph Stalin who was convinced that Hitler escaped to Spain in April of 194, or was did he try to manipulate the Allied?. In the chaos before everything turned quite, everything could has happened. All the confusion has probably caused so many different accounts from people. Is the truth something between? It was a big manhunt for Hitler during the beginning of the Second World War (1939-1940), but the real big manhunt for him didn`t start before the war ended. It become the greatest manhunt in the history of the world. Hitler is believed to have died after shooting himself in a Berlin bunker in 1945 when he realised Germany had lost the Second World War. As I read on the information board standing at the site where the bunker was: "30th April of 1945: During afternoon, Hitler and his wife Eva Braun (born Braun), who had married not long before in the bunker, committed suicide. Their bodies were then buried in the garden in the front of the bunker entrance." One difficulty in confirming the basic facts of Hitler’s suicide with his wife, Eva Braun, in the final days of the Allies’ approach to Berlin, was that the Russian troops did not give access to many forensic investigators. Did Hitler play a trick and escaped to South America? Did he took a plane or a submarine? Was he hided by his Nazi contacts in Argentina? CIA spend 20 years searching for Hitler in South America and other places around the world. This ended up with a 700 pages report included without no positive result even it included accounts from eyewitness who claimed to have seen Hitler. As I could observe on my tour to Berlin, there are historical sites and memorial monuments all around in the city from the Second World War, but not all the site where Hitler vanished. Today ...... The Führerbunker (English: "Leader's bunker") was an air-raid shelter located near the Reich Chancellery in Berlin, Germany. It was part of a subterranean bunker complex constructed in two phases which were completed in 1936 and 1944. It was the last of the Führer Headquarters (Führerhauptquartiere) used by Adolf Hitler. Hitler took up residence in the Führerbunker on 16 January 1945 and it became the centre of the Nazi regime until the last week of World War II in Europe. Hitler married Eva Braun here during the last week of April 1945, shortly before they committed suicide. Photo. Information board at the bunker site. After the war both the old and new Chancellery buildings were levelled by the Soviets. Despite some attempts at demolition, the underground complex remained largely undisturbed until 1988–89. During reconstruction of that area of Berlin, the sections of the old bunker complex that were excavated were for the most part destroyed. The site remained unmarked until 2006, when a small plaque with a schematic was installed. Some corridors of the bunker still exist, but are sealed off from the public. Records in the Soviet archives show that their burnt remains were recovered and interred in successive locations until 1970, when they were again exhumed, cremated, and the ashes scattered. Why did the Russians hide the so called remains from Hitler? Why did Stalin allegated several times that Hitler was still alive? Was it propaganda or did he knew better than other world leader at that time? Was it really Hitler a waitress observed in a Nazi hotel in Argentina? How could she claim it was Hitler despite she told that he has shaven of his mustache and used a wig? Was it or was it not blood in the room Hitler and Eva Braun suppose to take suicide (Hitler's study)? Eventually where their blood stains removed or washed? Why did no one hear the gunshot from when Hitler allegedly shot himself? Several witnesses later reported hearing a loud gunshot? The scull the Russians allegedly to be Hitler, was according American scientist based on DNA-analyses belonged to women under 40 year. Why did the Russians claim it was Hitler`s scull when they easily could use modern technique to find it out, and who was the women? Based on information from Wikipedia, accounts differ as to the cause of death; one states that he died by poison only and another that he died by a self-inflicted gunshot while biting down on a cyanide capsule. Contemporary historians have rejected these accounts as being either Soviet propaganda or an attempted compromise in order to reconcile the different conclusions. One eye-witness recorded that the body showed signs of having been shot through the mouth, but this has been proven unlikely. There is also controversy regarding the authenticity of skull and jaw fragments which were recovered. In 2009, DNA tests were performed on a skull Soviet officials had long believed to be Hitler's. According to the American researchers, the tests revealed that the skull was actually that of a woman less than 40 years old. The jaw fragments which had been recovered were not tested by the American researchers. Source: Wikipedia. Information about the Führerbunker: Government authorities wanted to destroy the last vestiges of these Nazi landmarks. The construction of the buildings in the area around the Führerbunker was a strategy for ensuring the surroundings remained anonymous and unremarkable. The emergency exit point for the Führerbunker (which had been in the Chancellery gardens) was occupied by a car park. On 8 June 2006, during the lead up to the 2006 FIFA World Cup, an information board was installed to mark the location of the Führerbunker. The board, including a schematic diagram of the bunker, can be found at the corner of In den Ministergärten and Gertrud-Kolmar-Straße, two small streets about three minutes' walk from Potsdamer Platz. Hitler's bodyguard, Rochus Misch, one of the last people living who was in the bunker at the time of Hitler's suicide, was on hand for the ceremony. Conspiracy theories about Adolf Hitler's death Conspiracy theories about Adolf Hitler's death contradict the majority view that Adolf Hitler committed suicide in his Berlin Führerbunker on 30 April 1945. Most of these theories hold that Hitler and his wife, Eva Braun survived and escaped Berlin (source. Wikipedia). During the last ten days of Hitler's Berlin, thirty thousand German teenagers perished defending their beloved Fuhrer in the Allied onslaught. Armin Lehmann was one of the few boy soldiers who escaped the bloodbath. Like every other member of the Hitler Youth, Lehmann would have gladly given his life for his leader. But he was not to be sacrificed to the enemy at the gate. Instead, he was chosen to serve in the German High Command's bunker complex. It was a stroke of fate that brought him into the company of the most notorious and bizarre Nazis of Hitler's hated Reich: Bormann, Himmler, Göbbels, and, of course, the Führer himself. Eyewitness: Hitler's last days (BBC: 26th April 2005): Bernd Freytag von Loringhoven, 91, is one of the last living eyewitnesses to Hitler's final days. Adolf Hitler committed suicide by gunshot on 30 April 1945 in his Führerbunker in Berlin. [a][b][c] His wife Eva (née Braun) committed suicide with him by ingesting cyanide. [d] That afternoon, in accordance with Hitler's prior instructions, their remains were carried up the stairs through the bunker's emergency exit, doused in petrol, and set alight in the Reich Chancellery garden outside the bunker. Records in the Soviet archives show that their burnt remains were recovered and interred in successive locations[e] until 1970, when they were again exhumed, cremated, and the ashes scattered. [ Hitler was declared dead officially Oct. 25, 1956, after his remains had been definitely identified. In 1945 Adolf Hitler has been killed at the Reich Chancery in Berlin, according to Hamburg radio. After Germany surrendered on 7 May, Himmler tried to escape, was captured and committed suicide on 23 May. A German court finally officially declared Hitler dead, but not until 1956.